We might be the second driest state in the USA but that doesn’t mean that Utah river rafting is anything short of spectacular. Our rivers have been carving their way through the Utah landscape for thousands of years, which is what makes rafting them so beautiful. Winter snow is the primary source of water, so flows vary year to year and season to season. For this reason, it’s good to consult with an expert or check flows before heading out on one of Utah’s awesome river rafting trips. Some say, through dubious origins, that Moab is the birthplace of Utah River Rafting; and it happened sometime around 1870. Though wooden boats of the past have long been replaced by state-of-the-art rafts, you can find many varieties of river-running vessels around the Moab area. It’s common to see SUPs, rafts, kayaks and duckies in one day. Moab’s rugged beauty is the perfect backdrop to enjoy a river rafting day trip. The beautiful Colorado River winds its way through the area and offers boaters a variety of water to explore. Whether it’s a smooth and scenic float or the heart-pounding thrill of a white-water adventure there is a stretch of river suited to anyone. The Green River is an excellent choice for a Utah river rafting day trip. Beginning in the Wind Rivers region of Wyoming the river flows into the picturesque Flaming Gorge Reservoir near Vernal, Utah. Many of the rafting day trip options begin on the section of the Green River after the Flaming Gorge Dam. A popular destination is Little Hole which is about 7 miles downstream from the Dam. Commonly known as “the aquarium”, the water is clear and cold and a favorite of fisherman for the visibility. The surrounding cliffs are beautiful. Longer, overnight trips into sections B and C are also fun. Most of the Green River winds through the plateaus of Southern Utah, in some of the most remote areas of the State. You’ll see the secret hide-outs of famous outlaws amid the dinosaur’s own stomping ground. A popular day trip through this area is the Green River Daily. Characterized as a mellow pool drop, this is a great beginner run for a variety of vessels. The water here could not be more different than Section A, as it resembles chocolate milk more than an aquarium. But there is tons of fun to be had here, nonetheless. Just outside of Park City, the Weber provides a remote experience with wildflowers and wildlife keeping you company along the river bank. See area farms, secret rock arches and off-the-beaten path scenery in this unique peak into Park City’s backyard. Although you will see many tubers on this river, we don’t recommend it. A fun afternoon can quickly turn scary if a tube pops or is lost in the current. If you are planning to tube this river, please invest in a high quality tube and stay alert! All Seasons Adventures has personable, trained guides to take you down this world class Utah river. We have high quality Puma and Super Puma rafts from Aire Inflatables. Add on transportation and lunch (optional), and this is a full service trip that guarantees fun. 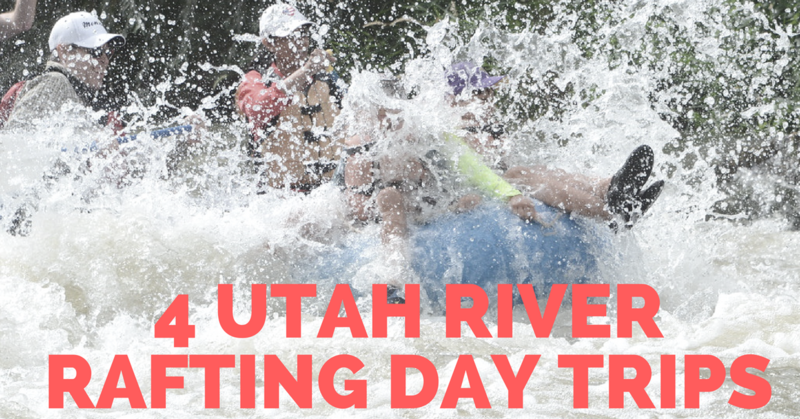 Grab a life jacket and a large tube of sunscreen because a day trip river rafting in Utah simply can’t be beat! I have been thinking about getting a group together and doing river rafting excursions. It would be great for some awesome memories while in the Moab area. I think it is cool, even if the claims are dubious that Moab is the birthplace of river rafting in Utah.